Wall Mount Bike Brackets. Easy to use. Designed to allow bikes to be spaced just 12″ apart. Lockable, Complimentary Bike Room Layouts, Free delivery, Lifetime Warranty. Generates Revenue. Manufactured with cushioned all welded steel with a shiny black, Powder Coat finish. Designed to maximize any size bike room while being easy to use and keeping the floor totally clear for safe passage. #42488 Wall Mount Bike Brackets provide long term, space saving solutions for Condo’s, Co-ops, apartment complexes, Office Buildings, Parking Garages. Anywhere space efficient bike storage is needed. 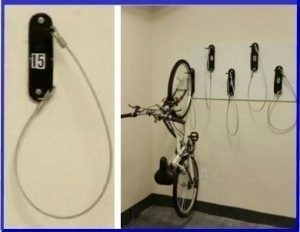 Attached to each #42488 Wall Mount Bike Bracket is a five foot long, Cushion coated security cable that can be wrapped around the bike frame, Both rims and secured with the bike owners lock. #42488 Wall Mount Bike Brackets pay for themselves in 4-5 months on average. Today most developers, Landlords, Condo and Co-op boards charge a monthly bike room rental fee, Ranging from $10.00 to $20.00 per bike. 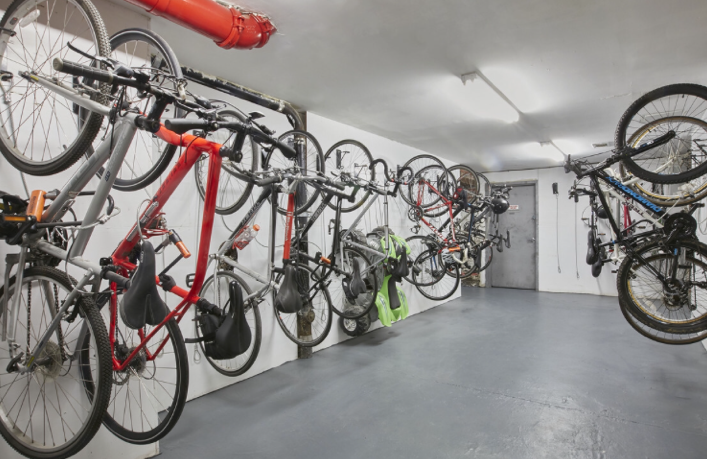 A bike room with 60 bikes spaces renting out for $15.00 will generate $10,800. 00 per year in revenue. Back with our lifetime warranty, #42488 Bike Brackets is a sound, long term solution. Included with our complimentary layouts is bike room set up suggestions that will keep the bike room space efficient, easy to use and within code. If the bike room has sheet rock walls, We suggest adding plywood supports over the sheet rock. 2″ thick x 22″ high. The plywood supports should be installed with toggle bolts if the studs are hard to find. 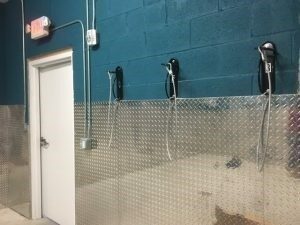 Prior to installing the bike brackets paint the walls in a matte or semi gloss finish for easy removal of dirt marks with a wet cloth. LockersUSA headquarters and warehouse is located in New York City, With distribution centers in New Jersey, Chicago, Los Angeles, Daytona Beach. Contact us today for immediate assistance. Sales@LockersUSA.com, P (888) 963-5355 or (917) 701-5795.